From the moment we first discussed family portraits, this Mom knew she wanted beautiful Fall Foliage, and I couldn’t wait to see what Charlotte, North Carolina had in store for us during my first Fall season in The Tar Heel State. But, unfortunately, what October and November had in store this year was rain – lots and lots of rain. So, that not only meant lots of rescheduled portrait sessions for almost every photographer in the area, it also meant that most of the leaves fell off the trees before they even finished turning colors. It was just that kind of season. But after a few weeks of rain, the sunshine finally came along with a few warm days to enjoy it. Now, I had to find a location that still had foliage but also find backdrops in an urban setting with a Fall feel. One of the first things I had to do in relocating was find new locations for my family sessions. Not only did we find a small park with foliage still on the trees, but as the sun dipped below the tree line, we moved to this adorable rustic shopping plaza to complete the session. Now we had a beautiful location, a gorgeous day, and it was time to work the family portrait photography magic. 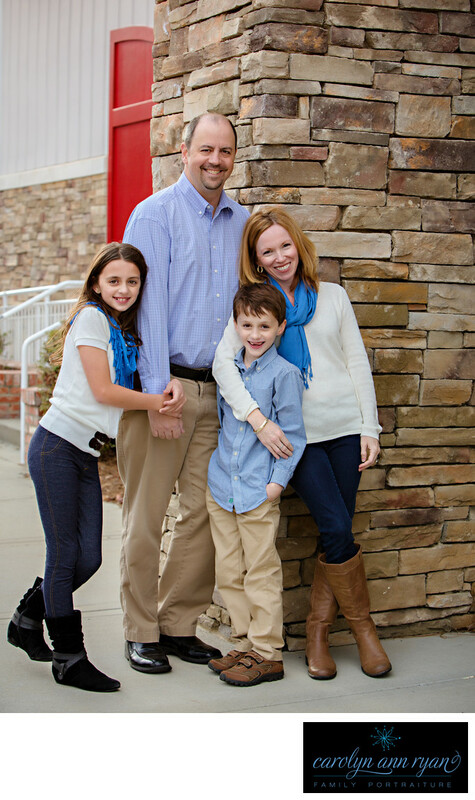 I hope you enjoy the photographs from this Charlotte, NC Family Portrait Session. Location: Robinson Farms, Charlotte, North Carolina. 1/250; f/5.6; ISO 250; 73.0 mm.